Mildred was born in Warminster, daughter of a wealthy cheese manufacturer and became a teacher. From 1906 she was a Language Mistress at Godolphin School, Salisbury but in 1917 departed so suddenly that staff wrote in the next school magazine they were unable to say goodbye. She joined the National Union of Women Workers, a group of women campaigners in Bath who saw the need for women police. Since 1883 the Metropolitan Police had employed Matrons to guard female and juvenile prisoners. Other forces used unpaid volunteers, often relatives of police officers, in similar roles. However no females patrolled the streets and the NUWW were determined to change this. Women’s Patrols were started in Bath and Bristol with a school in the latter city which provided 3 months training for 4,000 women during the war. Mildred became a Patrol Officer in Bath working out of the group’s office. Salisbury Police Force Register – Florence Mildred White pg.1. (F5/905/5) With permission of Wiltshire and Swindon History Centre. Salisbury Town Council decided to appoint a special woman patrol in March 1918. Duties included to take evidence of women and girls and children, … to advise and influence women and girls … exposed to temptation or difficulty, and to … patrol the City under the directions of the Chief Constable. When Mildred was appointed on 26 May she was enrolled with the same rights as a male constable including a pension, the first in the country. However it was not until April 1919 she received the same pay. 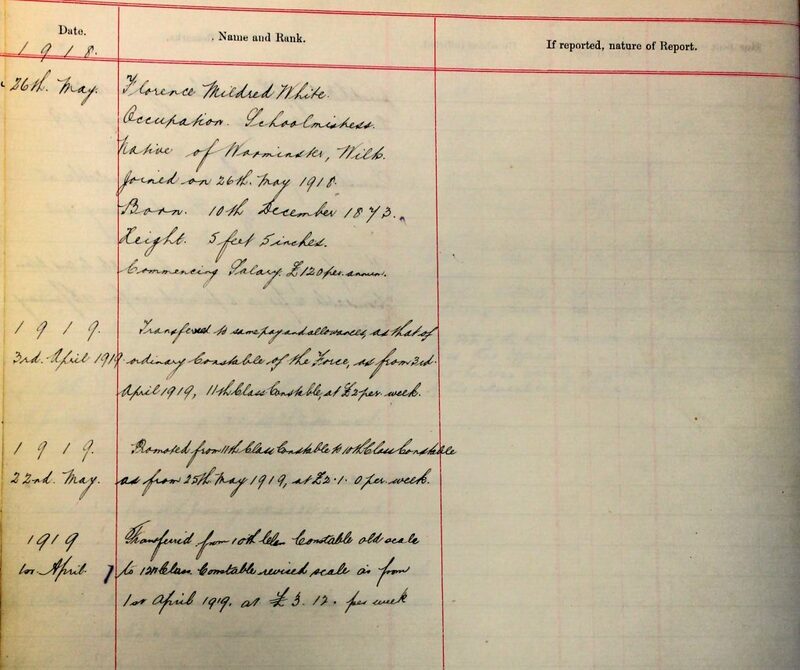 Salisbury Police Force Register – Florence Mildred White pg.2. (F5/905/5) With permission of Wiltshire and Swindon History Centre. She wanted to widen her experience and with the full approval of the Salisbury Police she transferred to Birmingham City Police in June 1925 as a Lady Enquiry Officer, equivalent in rank to Sergeant. Her workload was such it was necessary to recruit two assistants and in 1930 she was promoted Inspector, again the first in the country. Seven years later she retired.